Robert Zimmer discusses what it means to live the question – to look at the world with wonder. The key to living the question (according to Zimmer): challenge your assumptions, question others and listen. Read more from his Wall Street Journal essay. Robert Zimmer is a mathematician and former provost of Brown University. 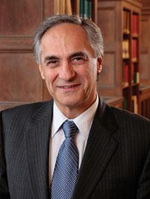 He is the current president of the University of Chicago.